Do you have questions about our Midnite Solar meters, or questions about solar in general? Give us a call at 1-800-472-1142. MidNite Solar's battery capacity meter uses a set of easy-to-read LEDs to display present battery capacity. The MNBCM battery capacity meter also features an extended charge status display that let’s the user know how recently the battery was charged. This battery meter is designed for a nominal input range of 12V to 48V (autosensing) with an accuracy rating of +/- .05 percent. Auto sensing, compatible with a nominal input range of 12V to 48V. The design and manufacturing of MidNite Solar's products is done at company headquarters in Arlington, Washington, and all qualify as "Made in America". 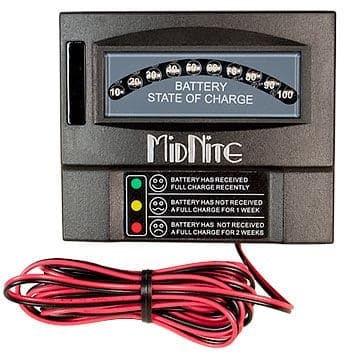 MidNite Solar specializes in renewable-energy-specific electrical components such as the Classic MPPT Charge Controller, a wide range of combiner and disconnect boxes, lightning arrestors and circuit breakers. The engineers are constantly designing and building products to meet and exceed the ever-changing electrical codes. The new MidNite Solar Birdhouse Emergency Disconnect Switch is a great example, it satisfies future codes requiring system owners to install a disconnect switch that emergency personnel can quickly and easily operate. The MPPT charge controllers produced by MidNite Solar incorporate some of the industry's most advanced features. The Classic MPPT Charge Controller is the first charge controller to include arc fault protection making it the safest available charge controller on the market. These versatile charge controllers can accept multiple types of DC inputs including solar, wind, hydro and other DC power sources. Available in a wide variety of sizes, there is sure to be a charge controller from MidNite Solar that will fit your system perfectly.